Last weekend we had the privilege of hosting a very distinguished guest named Flat Stanley. He was the emissary of a class in Hyde Park, NY. We were hoping to take him to the beach and give him a tour of San Diego, but unfortunately he had to head to Virginia shortly. 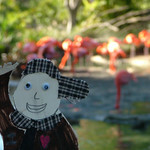 So instead we took him to the San Diego Zoo.